Happy hour and breakfast was included and made our stay perfect. Hotel is beautiful. An excellent surprise! Overall...the room was nice and housekeeping was very helpful. The property itself was beautiful, and the main hotel was very nice. The views were stunning and if you want remote, it’s pretty out of the way. The staff at the Asian restaurant were exceptional, specifically Christian. The hotel and the room were beautiful. The beds were comfortable, the bathroom was amazing, and the hotel itself was in a beautiful location. I like my room. The room was very spacious. I wanted to relax away from all the noise and it is the perfect place to do it. They offer many amenities. The shower was very big. I will say that the pictures are exactly what you see. It doesn’t lie and make the room more than what it is. I would definitely stay here again. The room was very spacious and had a dehumidifier that helped with my allergies. Great view of the landscape. The executive suite experience was excellent.The food at Lagos was great. The bowling alley was supurb. The service in the Medallion Lounge was beyond reproach. The management and housekeeping staff took care of the lack of cleanliness and stained furniture in a very timely manner. There was a microwave and ice machine when we needed it , also the stuff that was free with the room was good the water the shampoo and tooth brush etc. Even the shower and tub was amazing. The room smelled great when we first checked in. The beds were comfy and there was a lot of furniture in the room which I felt really added value to the room. A huge plus was that the toilet had a bidet and that the bathroom was huge. 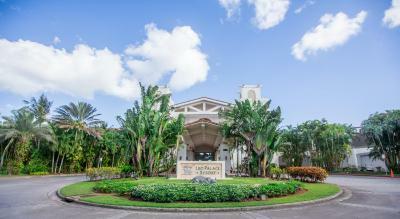 LeoPalace Resort Guam This rating is a reflection of how the property compares to the industry standard when it comes to price, facilities and services available. It's based on a self-evaluation by the property. Use this rating to help choose your stay! 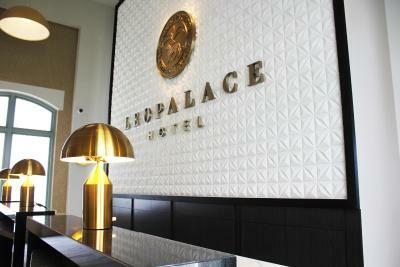 LeoPalace Resort Hotel features free Wi-Fi, a day spa and 4 on-site restaurants. 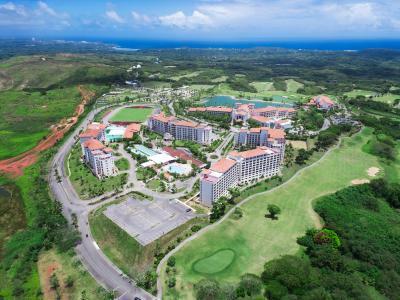 It includes a variety of recreational facilities including a 36-hole golf course, beach volley ball, tennis courts, 3 outdoor pools and a water park. 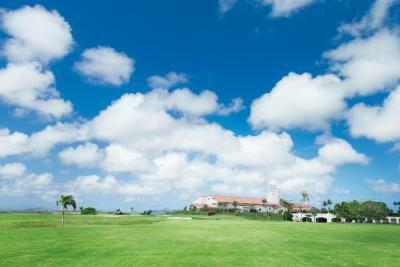 The property provides a tour desk, BBQ facilities, grocery store and a free shuttle service around the resort. The day spa offers manicures, pedicures, water treatments, hydrotherapy and body wraps. 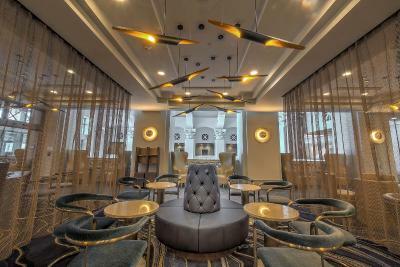 Guests can relax in the entertainment areas, which include the bowling alley, karaoke room and billiards. 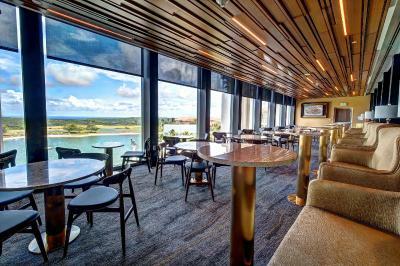 Dining options include Iki, which specializes in Japanese cuisine for dinner, Lago, which offers American meals all day and Gold Club which serves breakfast and brunch. All rooms offer lake or garden views and a flat-screen TV with cable channels. Some have a kitchenette with cooking facilities. LeoPalace Resort Guam is 15 minutes’ drive from Agana Shopping Center and the Cathedral of Dulce Nombre de Maria. Fish Eye Marine Park and Asan Beach are each within 20 minutes’ drive. This property also has one of the top-rated locations in Yona! Guests are happier about it compared to other properties in the area. This property is also rated for the best value in Yona! Guests are getting more for their money when compared to other properties in this city. 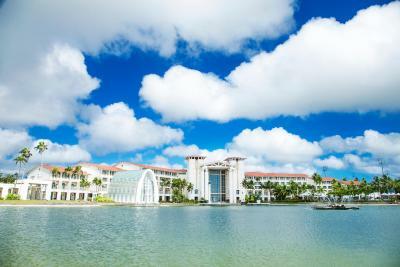 When would you like to stay at LeoPalace Resort Guam? 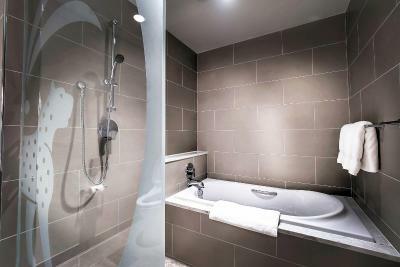 This room features cable TV, private bathroom with a separate bathtub and shower, and free WiFi. Maximum occupancy is 2 people (See Hotel Policies). 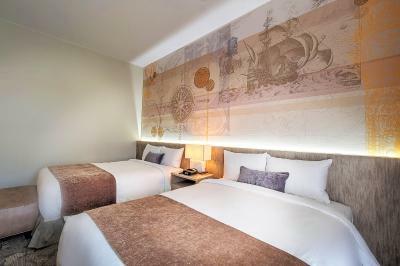 This room is slightly larger than the Superior Room and features cable TV, private bathroom with a separate bathtub and shower, and free WiFi. This suite features a kitchen and dining area. 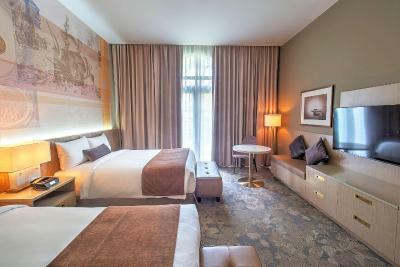 Each room offers beautiful mountain view from your balcony and specially designed Bolon floors from Sweden, and free WiFi. This 2-bedroom suite features a kitchen and dining area. 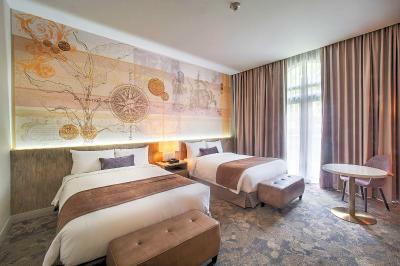 Each room offers beautiful mountain view from your balcony and specially designed Bolon floors from Sweden, and free WiFi. 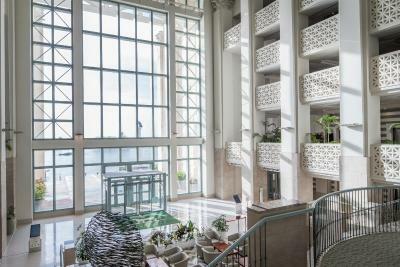 This 2 bedroom and 2 bathroom condo features a spacious kitchen with kitchenware, dining area, washer and dryer provided inside the unit, and Free WiFi. 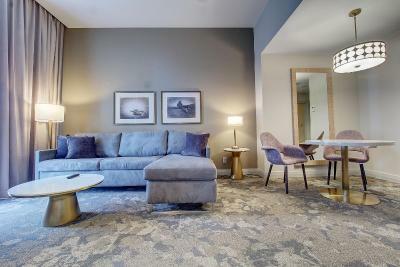 This 3 bedroom and 2 bathroom condo features a spacious kitchen with kitchenware, dining area, washer and dryer provided inside the unit, and Free WiFi. 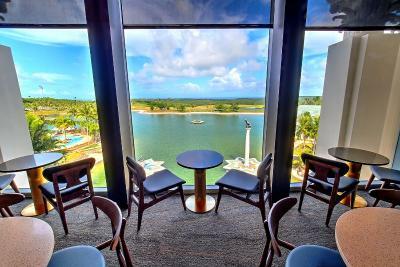 Each room offers a magnificent view of the Hibiscus Golf course from the balcony and specially designed Bolon floors from Sweeden. 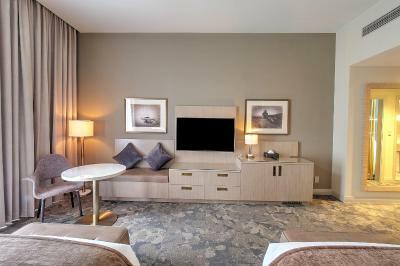 This suite features a lounge area and a mirror TV. There is a bathtub and complimentary L'Occitane Verbana series toiletries. Bed linen is provided. Medallion guests have full access to the lounge where continental breakfast and evening cocktails are served. 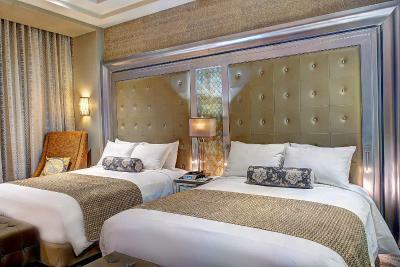 This suite features a air conditioning and a mirror TV. There is a bathtub and complimentary L'Occitane Verbana series toiletries. Bed linen is provided. This twin/double room features a balcony, seating area and soundproofing. This twin/double room has a balcony, flat-screen TV and soundproofing. 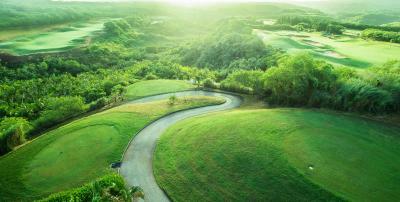 Welcome to paradise in the invigorating hills of Guam. 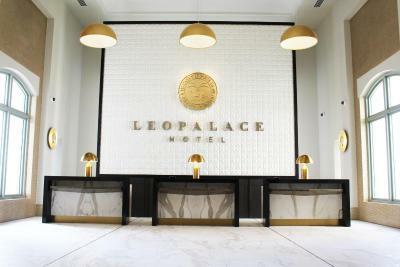 LeoPalace Resort offers a unique peace surrounding you with first-class facilities and breathtaking view of our lush landscapes that provide each of our guests the ultimate resort experience. 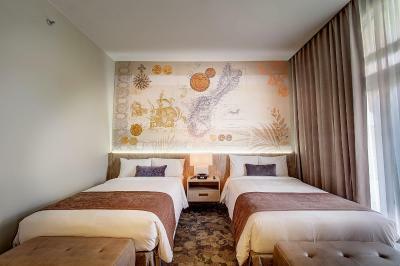 Guest Rooms- Our selection of room types offer conducive comfort to any traveler, whether it's for the family on vacation, executives on a business visit, golfers or even lovebirds on a romantic getaway. 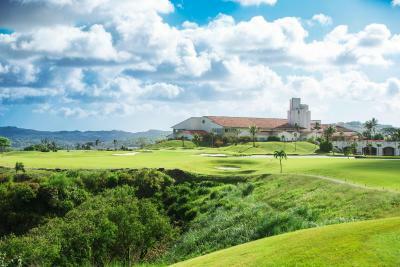 Restaurants- An array of fine and casual dining at Eataliano (Italian), Iki (Japanese), Tenku Yuzen (Asian), Lago (Cafe Restaurant) and Gold Club (Clubhouse Restaurant). 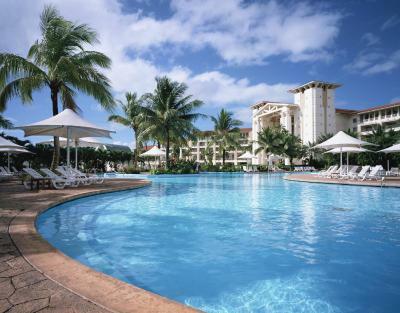 Pool- We have a number of spacious pool areas to meet the needs and desire of our guests visiting our resort. 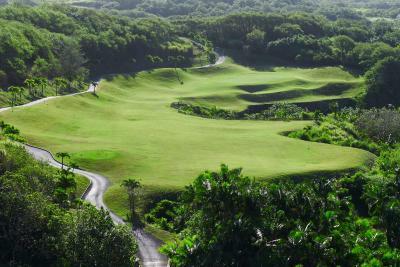 Golf- The most distinguished 36-hole championship golf course was designed by professional golfers, Jack Nicklaus and Arnold Palmer. 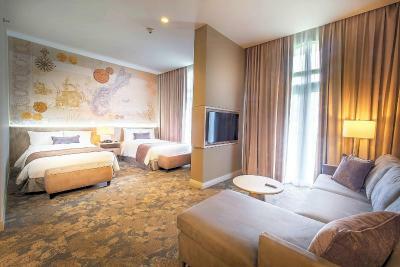 We also feature a relaxing and refreshing Spa, variety of fun entertainment areas such as Bowling Alley, Karaoke Rooms, Billiards and activities such as Star Watching Tour and Jeep Tour. Area Info – Show map Guests loved walking around the neighborhood! 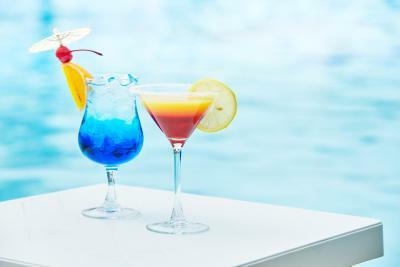 House Rules LeoPalace Resort Guam takes special requests – add in the next step! Any additional older children or adults are charged USD 44.40 per night for extra beds. 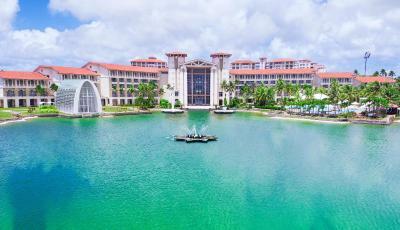 LeoPalace Resort Guam accepts these cards and reserves the right to temporarily hold an amount prior to arrival. 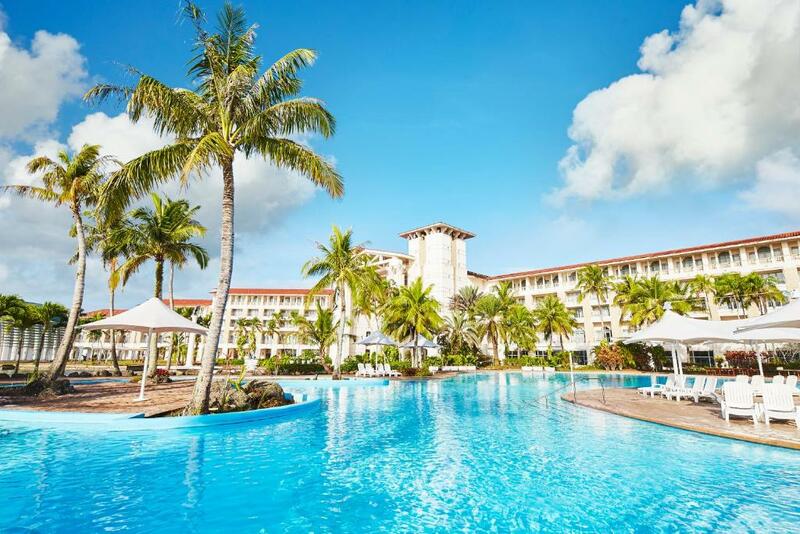 Please note that the property requires that guests are 18 years of age or older to check in. 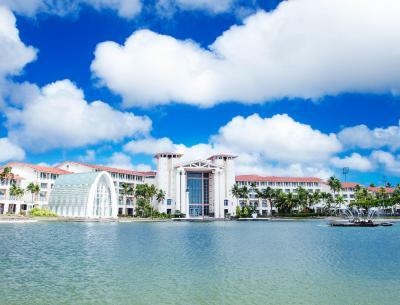 Please inform LeoPalace Resort Guam of your expected arrival time in advance. You can use the Special Requests box when booking, or contact the property directly using the contact details in your confirmation. The restrooms not cleaned good. I had to have the cooler which turn is actually a 'chill box' not a mini frig replaced because it didn't get a bottle of water past room temperature over night. The service person was quick and replaced the chill box with one that worked much better but I have no idea why they don't just have mini frigs as you always want a COLD drink on Guam. I didn't like the smell in my room but it's common in every hotel I've stayed at on Guam over the past 10 years. Moldy. I pack my allergy medicine and leave the balcony door open or ajar to help reduce the amount to mold I breathe in...regardless, I always return home with sinus congestion from Guam. I didn't eat at the hotel because I have to leave for work at 5:30am and nothing is open there so I go hungry or stop at another place near the work site if I can before starting work. 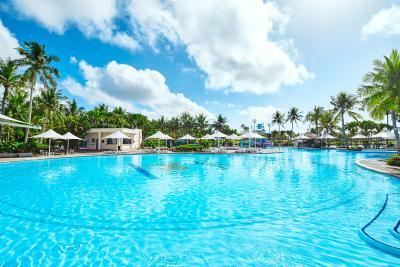 The location was great because I worked within 5 miles of the hotel and got to avoid the busy Tumon Bay area altogether. The beds were comfy and enjoyed the view of the pool from my balcony. Coffee in room. Better directions around the property. A little bit old fashioned room style, Shampoo,rinse,bathgel is present but can`t use due to block of opening. Quiet place, nice swimming pool, perfect kitchen system. Everything is great...but have the exterior of the buildings maintained and repainted. The pools are only meant for children. Hot water didnt work first night. The aircon was working great. Beds were made. The hotel is great, staff are average. Not friendly, not rude (the only staff very friendly were the bellboys). Other than that, it’s a shame the hotel charges their guests to utilize their fitness center & some of their mediocre activities (such as table tennis). ARE YOU KIDDING? Not even 5 star hotels charge for those things! I had issue with other occupants smoking on the Balcony. Hospitality was awesome. Rooms were very clean. Maid service was outstanding. Pillow menu. I prefer memory foam pillows. 1. When I checked in I was put back in Discover even though I was traveling alone. I was told I couldn't move. 2. The room I was given was dirty, curtains have holes all in them. The windows were covered in mold and you couldn't see out of them. 3. No access to food or drinks unless I take a shuttle and go to main building. 4. No lights on road leading to resort. 5. No one talked to me or checked on me or asked how my stay was going, 6. 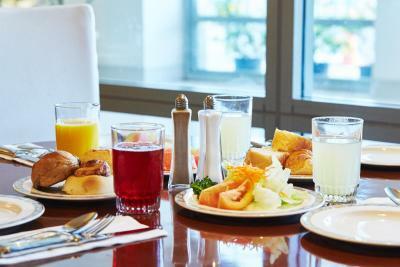 The one day I decided to eat breakfast at the hotel 9am there was no food! There wasn't even any water! I waited and waited. Finally got water. Then was told some food was coming. Finally eggs but not much else. I mean literally no food. So I ate eggs and bread. I was charged $26 for eggs and bread. I asked for a discount and she took $2.60 off the bill. (10%). Unacceptable. 7. When I spoke to the security guard at the pool he told me not to go near the lake as it had dead dogs in it. Not planning on ever coming back even though I will be regularly coming to Guam. When I arrived and came in to register I was so excited as the lobby building was like something out of a magazine. I was sure this was going to be a world class experience. The microwave took long to heat up food.